Property and leisure group Country Heights Holdings Bhd is targeting China as one of its overseas investment destinations to develop its integrated resorts, says its founder and deputy chairman Tan Sri Lee Kim Yew. He said Country Heights has been developing its prevention healthcare business over the past seven years, and is keen to grow the business both locally and abroad. "We are now looking for opportunities in integrated resorts and we have targeted China for future growth," he said on the sidelines of the two-day World Chinese Economic Forum in Kuala Lumpur yesterday. Membership cards will be used to attract the Chinese to enjoy this form of lifestyle, but he does not intend to look at the big cities at the moment, saying the benchmark is too high. "For us Malaysians entering the market, making US$20 million to US$30 million (US$1 = RM3.36) (from the investments) is already very good." Lee's argument is that China will continue to enjoy a 7 per cent average growth for the next 20 years, raising its per capita income of its people further from the current US$3,000 with areas like Shanghai having a per capita income of US$10,000. "China is a big market ... domestic demand will expand and, with a renminbi that has appreciated, the buying power of its consumers will be greater," said Lee. 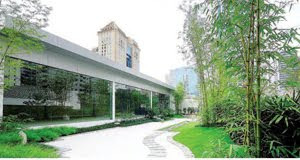 In his private capacity, he has undertaken a residential property project in Guangzhou through a 400 million renminbi joint venture and made about 30 per cent in profit. "It was a project well done two years ago, and the 287 resort-style country bungalows we built have been fully taken up," he added. Lee, who is also joint co-chairman of the Malaysia-China Business Council, said Malaysian businessmen should take advantage of the political relationship which both governments now enjoy. "Through these forums (such as the World Chinese Economic Forum), we hope to bring more Malaysians of all races to venture into businesses in China." The two-day World Chinese Economic Forum is jointly organised by Country Heights Holdings Bhd, Easy Pha-max and the Asian Strategy and Leadership Institute (Asli). SHAHRIL Ridza Ridzuan, group managing director of Malaysian Resources Corporation Bhd (MRCB), has won the "Property Chief Executive Officer of 2009" award given by the International Real Estate Federation (FIABCI) Malaysian Chapter. Shahril, who received the award at a ceremony yesterday from the Sultan of Selangor Sultan Shahrafuddin Idris Shah, joined MRCB as executive director in 2001 and took over the helm in 2003. He helped MRCB to grow during the Asian economic crisis and launched some six million square feet of new development and now it has a development order book exceeding RM6 billion. The award presentation, which was held for the 17th time, also saw winners in six other categories. They were UEM Land Bhd in the master plan category for Puteri Harbour in Nusajaya, Johor; Selangor Dredging Bhd for residential development (high rise) for Park Seven Kuala Lumpur; Perdana ParkCity Sdn Bhd for residential development (low rise) for Adiva Kuala Lumpur; Boustead Curve Sdn Bhd for retail development for The Curve Mutiara Damansara; Menara Hap Seng Sdn Bhd for Menara Hap Seng Kuala Lumpur; and MRCB for purpose-built project for Sooka Sentral Kuala Lumpur. The winners will represent Malaysia to compete with other 60 countries in the international award event which will be held at the FIABCI 61st World Congress in Bali, Indonesia, in May 2010. KUALA LUMPUR: Fraser & Neave Holdings Bhd's phase two of the Fraser Business Park is expected to be completed by the second quarter of next year. The project has a gross development value (GDV) of RM350 million. A multi functional hub, the phase two is designed to be the largest electronic gaming and multimedia centre in the region, he told a press conference here on Tuesday. Phase one of Fraser Business Park comprising 80 shop/office units, launched in early 2004 with a gross sales value of RM182 million was completely sold out. The units were handed over in December 2006, six months ahead of schedule, Cheah said. Phase two include the largest ICT hub developed by Brampton Holdings Sdn Bhd to be completed in January next year, Help University college with hostel complex, serviced apartments, e-Hotel, retail entertainment space, hypermarket, food court and outlets and 1,800 parking lots. Cheah said the ICT retail lots offered for sales had been snapped up very quickly. "There are over 800 lots for lease, of which over 500 units are ICT lots. So far, for the over 500 units, over 300 parties have shown interest and have been negotiating with us. "We expect over 200 ICT operators to sign lease agreements soon as they would be our anchor tenants," he explained. The 251 serviced apartments have been sold in bulk to a local private company while Brampton Holdings signed a long-term lease with Help University College with an estimated student population of 5,000. Cheah said the phase three comprising corporate offices to be built later, will complete the Fraser Business Park. MALAYSIAN Resources Corp Bhd (MRCB) group managing director Shahril Ridza Ridzuan, a strong proponent of innovative building practices and high speed connectivity, is driving greater technology integration in the company’s property projects. Malaysian Resources Corp Bhd group managing director Shahril Ridza Ridzuan. The recipient of the prestigious Property CEO of the Year at the International Real Estate Federation (FIABCI) Malaysia Property Award 2009 believes that putting technology to good use will result in tremendous gains for his company’s property buyers, tenants and investors. Sultan Sharafuddin Idris Shah presenting the award to Shahril Ridza Ridzuan (right). Shahril’s great interest in technology, born from being an avid reader all his life, has led to a belief in the benefits of personal connectivity. His “influence” can be seen in the development of KL Sentral – MRCB’s crown jewel and a prominent landmark in Kuala Lumpur. Kuala Lumpur Sentral, recognized as a prestigious business and residential address, is an exclusive urban centre offering global connectivity, good investment opportunities, business conveniences and an international lifestyle. 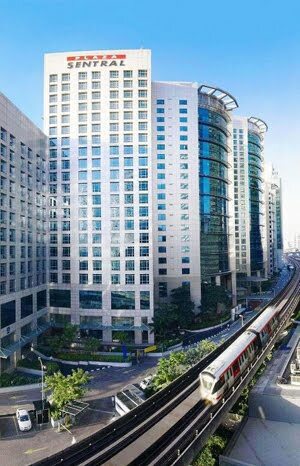 KL Sentral, a prime 72-acre freehold commercial and residential development built around a world-class transportation hub, kicked off in 1997. The integral part of the KL Sentral development is Stesen Sentral, an integrated transportation hub that started operations in April 2001 with the aim of enhancing public transportation in Kuala Lumpur through an integrated rail network. According to Shahril, KL Sentral was the first private development in the country to be conferred MSC Cybercenter status back in 2006. Since last year, all the public areas in KL Sentral are Wi-Fi ready – providing a critical utility in the hands of travellers, tenants and visitors for free. “Our building tenants are subscribing for up to 40 to 50 Mbps for their connectivity needs through our integrated fibre backbone. We continue to push technology into all our new buildings with a firm commitment towards low-energy and sustainability technologies. Our approach is to try and anticipate the future demand for these technologies,” says Shahril in a recent interview. In the last four to five years, the development of KL Sentral has progressed tremendously with projects worth RM3bil built to date. This year, projects with a total built-up of six million sq ft, worth RM7bil have been launched. They include a 30-storey 400 room boutique hotel, six new office developments, a service apartment project and the Nu Sentral mall. Another six million sq ft of space are still in the pipeline, of which three million sq ft of residential and commercial space will be launched next year and the final parcel of three million sq ft will be launched in 2012 for completion by 2016. He says that by next year, MRCB would have achieved the status as the biggest developer of prime office space in the country. In an effort to support sustainable development, all the new developments will incorporate features to improve energy efficiency, less water wastage, and recycling capability. Among them, the new Shell headquarters will comply with the LEEDs Gold Standard while the KL Sentral Park will be designed to meet the BCA Greenmark Platinum Standard. All the new developments will also be certified under Malaysia’s Green Building Index, as MRCB is a keen supporter of the development of local standards suitable for our conditions. By 2016, at least 10 to 11 million sq ft of the total built-up space of 16 million sq ft of usable commercial space will have some form of minimum compliance to the Green Building Index. “Even our old buildings including 1 Sentral that was completed in 2007 can be submitted retrospectively for a compliance rating,” he points out. Shahril says although MRCB is not one of the largest listed groups on Bursa Malaysia, it aims to do things differently by leveraging on technology to create wholesome and sustainable living and working environments. “What is important is to recognise the reality of our strengths and weaknesses; take calculated risks and do things differently; and focus in what we do best,” he adds. The law graduate from Oxford and Cambridge universities was 31 years old when he joined MRCB’s board as executive director in 2001. 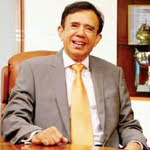 He was appointed chief executive officer and group managing director in 2003. Besides property development, MRCB’s forte lies in engineering and infrastructure sectors. Shahril believes in creating partnerships to optimise the company’s resources. “Interaction and networking with other people are important to widen our scope of knowledge. In the absence of such interaction, there is the danger of becoming too insular and not open to new ideas,” he says. That explains why most of the buildings in KL Sentral are based on a quasi-real estate investment trust model where MRCB will develop and operate the buildings for financial investors. By adopting the development model of partnering with institutional partners and funds to come in as investors, the company aims to accelerate its KL Sentral development. It has also sold two parcels of land to UEM and Quill Capital for their own projects respectively. The development model has also been extended to other MRCB projects. Pelaburan Hartanah Bhd, which has taken up a 49% stake in the Nu Sentral mall, is also in joint ventures with MRCB to undertake three projects in Penang. MRCB’s strategy continues to focus on owning the retail assets that it develops. In KL Sentral, it owns Sooka Sentral with a gross floor area of 180,000sq ft and the upcoming Nu Sentral retail mall with 1 million sq ft that will be completed in 2012. In addition to that, MRCB is also planning a second phase to its Alam Sentral mall in Shah Alam. Going forward, Shahril sees MRCB growing into one of the leading industry players in the property market. “Currently, we are still very focused on the KL Sentral development as well as our present mixed use townships. We are looking at expanding into other segments and will need to recycle our capital quickly and harness our financial capability,” he explains. Despite his busy schedules, Shahril makes it a point to be home by 8pm to dine with his family. “I try to have a fairly balanced life. It is important to appreciate your family and spend time with the kids during their growing years,” he adds. 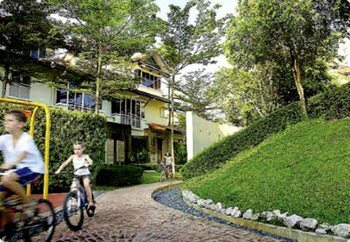 HOME is not just where the heart is, but a place where people rest and spend time with their family, says SDB Properties Sdn Bhd managing director Teh Lip Kim. “Building homes and providing purchasers with extraordinary living experiences with the concept of living beyond the four walls is what we believe in,” says Teh. Park Seven Residences at Persiaran KLCC. With extensive research done and meticulous effort to produce Park Seven, also known as “bungalows in the sky”, SDB Properties truly deserves to be the winner of the Malaysia Property Awards 2009 under the Residential Development (High Rise) category. “We are delighted that our flagship development is recognised by the industry as one of the best,” adds the delighted Teh. Teh wanted Park Seven to be a 21st century interpretation of traditional tropical architecture that has a design that ensures maximum natural light and ventilation. “When we developed Park Seven, we wanted to come up with a building that would be special and add interest to the KL skyline. A lot of work was put into the concept, which was to build comfortable, light-filled spacious homes in the heart of the city. We even walked the extra mile in making Park Seven an earthquake resistant building at no extra cost to the purchasers,” says Teh. One thing that makes Park Seven unique is its “Back to Basics” theme – merging tropical living with contemporary design. SDB Properties took into consideration the question of how to live comfortably in our tropical climate, and incorporated this in their designs; ensuring there is ample ventilation in the home, and making the most of abundant natural light. Its 11 feet high ceiling and floor-to-ceiling windows maximises cross-ventilation and natural lighting within each unit. As it is “Back to Basics”, materials were carefully selected. Instead of having gloss or shiny surfaces, materials were left in their natural state to give the building a natural feel. For example, the fair face concrete for the façade is exposed, impregnated with a water repellent solution. The timber used is unstained with a natural finish while granite and marble are honed and unpolished. The usage of fair face concrete requires a great amount of care in ensuring the concrete formulation remains consistent throughout the construction period in order to ensure the concrete is well compacted. All pipes and electrical conduits on the concrete wall needed to be determined early as they had to be cast in at the time of constructing the wall. Accuracy in location was also important as any mistakes would be difficult to rectify. Park Seven is a structurally earthquake resistant residential building. It is designed to withstand the horizontal force of an earthquake and complies with British standards and the Indonesian Seismic Code. This came after the seismic activities in the Sunda Trench on Dec 24, 2004 which resulted in tremors felt in various parts of West Malaysia and the unfortunate tsunami incident which affected various countries. Despite the fact that Malaysia is not located in the area zoned for any level of seismic activity, SDB Properties were proactive in the situation and consulted its engineers on the seismic structural study for Park Seven. Hence, making the building even safer to live in. Designed with understated luxury in mind, Park Seven comprises only 105 spacious units ranging from 204.3 sq m (2,200 sq ft) to generous 5-bedroom duplexes of around 408.7 sq m (4,400 sq ft). 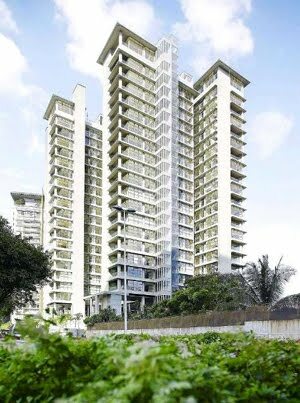 It reconciles high-rise living with the spaciousness of a bungalow. Homes are spacious because they have column-free flat slab ceiling within the unit – no pillars or beams running across the ceiling and optimising ceiling height and a sense of openness. The thickness of floor slabs is 300mm, providing improved sound insulation in each unit. Homes are private with only one unit per floor with a private lift and the private lift lobby area gives added privacy for each home. The homes not only come with fully fitted dry and wet kitchens as well as wardrobes in all rooms; most units feature large balconies measuring 6.5 feet in depth. A beautiful night view of the KL twin towers from the Recreational Deck. Level one of Park Seven is the Recreational Deck which is a 3386.4 sq m (36,451 sq ft) area that houses two swimming pools (lap pool and heated pool), a jacuzzi, gym, yoga/pilates studio, toddler’s room and function rooms. With a full view of the KLCC towers and breezy cross-ventilation, the deck serves as a place for anyone to unwind and rejuvenate. SDB has certainly not forgotten about preserving the environment. In line with its theme, materials chosen are left as much as possible in the natural state and this reduces energy used in processing materials. Fair faced concrete is cast on site, thus reducing the cost of transportation, plastering and painting. In addition, a specialised self-cleaning concrete sealer is applied on the fair face concrete for long-term maintenance. As for the radial arrangement of the seven blocks of apartments, it maximises natural daylight and cross ventilation into each unit, reducing energy costs for each unit in the long run. The seven blocks of apartments share two central cores. This allows for more efficient mechanical and electrical distribution which reduces energy wastage. SDB has made each unit even more energy efficient by mounting in expansive windows that provide substantial natural lighting in the day and well into the late hours of daylight. The laminated glasses also help reduce heat load and hence air-cooling load over the life of the building. Every aspect of the building has been well planned, even the car park on the ground level. Stones from the local quarry were used for the Gabion feature walls at the car park and boundary walls. It keeps the car park cool and maximises natural lighting throughout Park Seven. Being relentless in its endeavours, SDB Properties aims to continue developing homes that are comfortable, of quality, and meeting the standards of discerning customers. Property developments shape the very nature of a country. Quaint homes, iconic buildings and landmark developments do more than just house occupants; it adds to the nation’s kaleidoscope of energy that make it so unique. Right now, no one seems to do this better than UEM Land Holdings Berhad (UEML). It’s ambitious Regional City, Nusajaya, is a 24,000-acre urban development in South-west Johor, which is a key component of Iskandar Malaysia and it will alter Malaysia’s economic and social landscape significantly. Offering global businesses and residential markets a dynamic and international playground, this magnificent development will undoubtedly give Singapore’s urban development Sentosa Cove stiff competition. Making international headway, Nusajaya’s up-market mixed golf residential development Horizon Hills was awarded the ‘Best Asia Pacific Golf Development by CNBC’s Property Awards 2009 early this year. And now, more recognition comes its way. Puteri Harbour promises a unique and luxurious lifestyle community and will spawn an enviable combustion of tourism, culture, business and high living. The Master Plan Category, the most coveted category in the Malaysia Property Awards (MPA), was bestowed on Puteri Harbour Waterfront Development, one of the seven signature developments in Nusajaya. This exquisite development, dubbed ‘luxury’s new attitude’ is a rapturous land parlaying an integrated waterfront and marina development that spans 688 acres, beguiling visitors with its view of the Straits of Johor. Work on Puteri Harbour commenced in 2007 and the development will see completion in 15 years. Puteri Harbour’s development comprises waterfront residential properties with canal homes and villas with private berths, commercial and retail development, resorts, hotels, a convention centre, Customs, Immigration, Quarantine and Port Clearance, transport hub with water transport terminal for water taxis and ferries, three fully integrated marinas and many other amenities. Make your way to Puteri Harbour to enjoy the calm waters of the Straits of Johor. It promises a unique and luxurious lifestyle community and will spawn an enviable combination of tourism, culture, business and high living. There is no other luxury living like Puteri Harbour and this will greatly impact Malaysia and its standing in the world. The best people were brought to the Puteri Harbour team to ensure a truly excellent product. Professor Philip Cox of Architects & Planners from Sydney was brought in. Cox was a heavyweight in waterfront development who had his name attached to all major waterfronts. Oculus, also from Australia, was brought in to oversee landscaping and Sinclair Knight Merz – one of Australia’s top security firms put in their expertise to ensure security in Puteri Harbour was tight. ‘We are very grateful that FIABCI Malaysia has selected us. There is nothing better than having someone else endorse our product,’ says UEML managing director and CEO Wan Abdullah Wan Ibrahim. Knowing full well that crime in Johor Bahru has a reputation of its own, UEM Land faces it head on. The latest in surveillance technology can be seen in Puteri Harbour to deter criminals and keep its residents safe. Submissions for the Master Plan category saw a great many impressive plans from hopeful developers. But Puteri Harbour offered more. Take for instance, when UEM Land had to excavate land in constructing Puteri Harbour. Environmental guidelines see that a developer has to ensure silt is filtered before going into the Straits of Johor during excavation. UEM Land invested in a RM15 million double layer silk screen to ensure the highest standards in preserving the environment. This screen was the first in the country to be used. The great passion and effort into making Puteri Harbour a bejewelled waterfront was further encapsulated in its urban design guideline. Each aspect such as building height, building setback, interfacing, view of corridors, green impact, landscaping, principles of road and public transportation were all documented. They have gone a step further now in submitting their urban design guideline to the municipality in hopes of seeing these best practices carried out when land is sold. Should the municipality share their vision, Puteri Harbour’s value will only go higher up. Nusajaya is expected to achieve its tipping point in 2012 mainly due to the completion of key projects from 2010- 2012 which include Bio-Xcell, NuMed Nusajaya, new residentials, Coastal Highway, Puteri Harbour Buildings, Legoland, Federal Admin Centre, SiLC, International School (Marlborough College), hospitals, etc. For the uninitiated, a tipping point happens when a slow reversible change becomes irreversible change with dramatic consequences. Such a mammoth project requires the sheer dedication of management and staff, “Where management can only plan, nothing can take off without a good implementing team. Led by our Puteri Harbour general manager, Zamani Kasim, who sees to every detail of the development, I am happy to say that our success is due to our highly dedicated staff. On Nov 7 2009, UEM Land Berhad, the wholly owned subsidiary of UEM Land Holdings Berhad and the master developer of Nusajaya entered into a Sale & Purchase Agreement valued at RM26.7mil with Themed Resorts and Attractions Sdn Bhd (TAR), a wholly-owned subsidiary of Khazanah Nasional Berhad, the investment holding arm for the government of Malaysia. Under the agreement, TAR will purchase two parcels of land totalling approximately 4.221 acres that form a part of Puteri Harbour for the development of a complex that will house the first family indoor theme park, a 300-room hotel and retail outlets. The indoor theme park has three gated floors with the two umbrella brands, namely Sanrio Hello Kitty Attraction and The Little Big Club, taking centrestage. A series of entertaining rides and other attractions will be available for those visiting Thomas & Friends on the upper floor. Lat’s themed family restaurant, on the ground floor, will offer visitors a taste of Malaysia’s favourite and popular dishes. Early this year, Wan Abdullah and UEM’s former managing director Datuk Ahmad Pardas Senin took a walk on the developing grounds of Puteri Harbour. The sun was shining and the air was abuzz with activity as cranes rose high in the air and busy workers went about their way. And that is the sum of Puteri Harbour. The fruition of passion, the stuff of dreams and a proud icon to the country. The three-storey mall houses more than 250 shops, restaurants, kiosks and outlets which attract more than two million visitors a month through its doors. 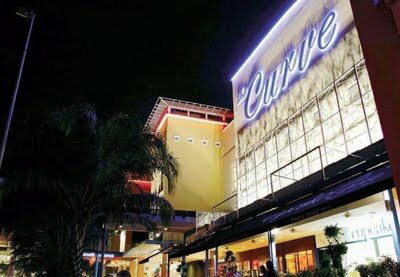 THE CURVE, with its distinctive lifestyle pedestrian mall feature has brought a breath of fresh air to the local shopping and dining scene since it opened in December 2004. Developed, owned and managed by the 180-year old diversified conglomerate, Boustead Holdings Berhad (a subsidiary of Lembaga Tabung Angkatan Tentera (LTAT), the Malaysian Armed Forces Pension Fund for members of the other ranks in the Armed Forces), The Curve sits on a 13.97-acre site in the heart of the vibrant township of Mutiara Damansara, one of the fastest growing townships in the Klang Valley. The three-storey, 633,000 square feet mall houses more than 250 shops, restaurants, kiosks and outlets which attract more than two million visitors a month through its doors. The Asian and Western Courtyards, Piazza, Terrace, Fashion Court, Centre Court and Street are venues for activities throughout the calendar year. On weekends, the Flea Market at the Street creates a carnival atmosphere whilst the Piazza is the venue for car shows, hip-hop dance competitions and football league viewing on giant TV screens. The sky-lit glass ceiling Centre Court plays host to the annual Malaysian Squash Open, Fashion Week and, Hari Raya, Chinese New Year, Deepavali or Christmas decorations adorn the Centre Court and the entire mall in celebration of Malaysia’s many cultures. One of the best year-end countdown parties is at The Curve and a much anticipated event for Klang Valley residents, which culminates into one of the longest fireworks shows at the stroke of midnight. Built at a low plot ratio of two, the design and development of The Curve has taken cognisance of the need to reduce carbon footprint and this low density feature together with the use of non-peak electricity at night to create ice for air-conditioning puts minimal demand on infrastructure and amenities in the township. The well landscaped courtyards with their water features and manicured external fringes around The Curve create a lush green backdrop for the mall. Designed to capture the elegance and relaxed atmosphere of open air dining, The Curve allows visitors to stroll along its main Street, which is flanked by some of the best eateries with al-fresco seating, in an unhurried manner without the hassle of oncoming traffic, exhaust fumes or having to worry about safety, whilst deciding which restaurant to dine in. Within the enclosed three-storey Fashion Court, one finds international brands side by side with home grown Malaysian brands. MNG (Mango), Debenhams, Metrojaya, Uluwatu, Calvin Klein Jeans, Naf Naf, British India, Padini, G2000, Giordano, Nichi, Kitshen, Binwanis, Habib and Primavera are some of these brands. The clean, high ceiling, brightly lit and secure car park basements greet visitors upon entry and transport them into a world-class shopping and dining experience. The choice of food at The Curve is mind boggling with Asian, Western and everything in between. Favourites are The Little Penang Kafe, Ah Tuan Ee, Sakae Sushi, Bubba Gump & Shrimp, Italiannies, TGIF, Warong Penyet, Marche Movenpick, Kim Gary, Dragon-I, Thai Express, Pho Hoa, Paddington’s Pancakes, Hometown Kopitiam, Starbucks, Coffee Bean and Gloria Jeans. The man behind the project: Datuk Ghazali Mohd Ali the director of Boustead Curve Sdn Bhd. Apart from fashion and food, books, childrens’ apparel and activities, home furnishings, music and karaoke, gym and beauty salons can be found among retailers such as Borders, MPH, Tumble Tots, Mothercare, Anakku, Daiso, Living Quarters, Ideko, Sony Style, Red Box, Yamaha Music, Jean Yip, Yun Nam Hair, London Weight Management, Peek-ABoo, Fitness First and Floor Depot. Ancillary to its main shops are the banks, money changer, fruit and juice stands, convenient 24-hour store, clothes alteration shop, newsstands, car wash, florist, shoe repair kiosk and even a Police Traffic Summons Counter. Strollers, electric wheel chairs, motorised scooters and baby changing rooms ensure that the disabled and new mothers are also catered to. The Curve is disabled friendly in its design of gently sloping ramps all around the mall. Disabled parking is available in the basement car parks and is clearly marked out in all the mall directories. Uniformed security personnel and CCTV cameras located throughout the mall are a commitment towards the highest level of safety. An added service is the security personnel in buggies, which offer shoppers rides to their cars in the two basement car parks. An hourly shuttle bus service, courtesy of The Curve takes shoppers downtown to main hotels and key drop-off points in the city. The Curve is anchored by world-class retail establishments namely, IKEA Home Furnishings, IKANO Power Centre, Tesco Hypermarket and e@Curve. These anchors are connected to The Curve via a series of underpasses, overhead bridges and covered streetlevel crossings which allow shoppers to move freely from one mall to another seamlessly. The Royale Bintang Damansara Hotel, a 150-room four-star boutique hotel is located within The Curve and offers shoppers from out-of-town convenient accommodation without having to leave The Curve. The defining factors that set The Curve apart from others is not only found in its ‘Hardware’ but also in its ‘Software’, for example managing the delicate balance that is required to retain only the best retailers and providing world-class customer care to the shopper while keeping a firm grip on the cleanliness, safety and overall ambience of the mall. Imagine living amidst wide open space and lush greenery in beautifully designed homes that have a resort feel. In today’s hectic lifestyle, coming home to a place that lets you unwind, relax and spend quality time with your loved ones underscores the quality of life. 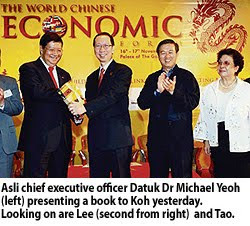 Lee Liam Chye is the group chief executive officer of Perdana ParkCity Sdn Bhd. This desirable lifestyle can be found at Adiva, a development by Perdana ParkCity Sdn Bhd, which unsurprisingly has been declared the winner of the Residential Development Category (Low Rise) by FIABCI for the Malaysia Property Awards 2009. According to Group chief executive officer Lee Liam Chye, “We are thrilled and honoured by Adiva’s success. This is truly a wonderful trophy for our hall of achievements. The design is all about connecting spaces, connecting people and connecting lives to make everyday living special. It teases with a subtlety that surprises you with hidden delights. The result is a special, guarded and gated neighbourhood with a deep sense of tranquility. Tight security gives residents peace of mind. Homes blend naturally with landscaped parks that hold delightful surprises. Go green: A walkway lush with trees makes for a perfect laidback stroll. The neighbourhood also provides a safe place for children to play. During the conceptualisation of the development, Lee actually did not have any bigger-than-life agenda. What he really wanted was to eliminate the inconvenience and discomfort of terraced house living that he had personally experienced before. He and his team compiled a list of bugs that need to be worked out and came up with the best way to overcome them. More interestingly, Adiva is the first of its kind to offer strata titles instead of the usual land titles. This was an untested idea at the time, which many people thought was unfeasible. “Looking at Adiva today, my team and I are gratified by how it touches people’s lives and how people have shaped it,” he said. In Lee’s opinion, to fulfill the needs for holistic living a development need to incorporate both tangible and intangible qualities and features. “These are what I feel a development must possess for holistic living. Tangible ones are easy enough to produce-security, welldesigned homes and open space. Intangibles are not so easy as they deal with people’s cultural codes and social needs. Property practitioners are not equipped to deal with this. You need to be a sociologist or psychologist to fathom the working of people’s minds,” he commented. The concept of holistic living styles has not changed much over the years. It is the solutions that have evolved to become better and more relevant to practical requirements and aspirations. Trends today strongly indicate that holistic living styles are here to stay. However, it is important to understand that holistic living styles cannot be invented overnight. These have to be conceived at the onset of the development. Planning and design DNA are then forged to shape all development initiatives. The substance remains the same, but the expressions of form change according to what the developer perceives people prefer. The success of Adiva can be clearly seen from the response of buyers. Its 160 units, which include unique first-of-its-kind courtyard terraced homes were snapped up in weeks. Today, Adiva’s capital appreciation has doubled and homes are highly sought after in the expatriate rental market. In fact, there are currently about 100 expatriate families living in Adiva, and this number is growing. The Japanese garden located on the roof of Menara Hap Seng. 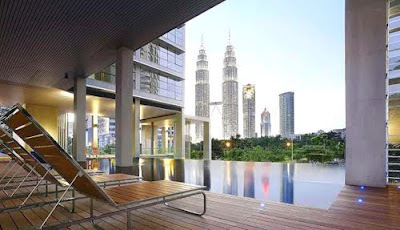 Set within the highly desirable and internationally acclaimed Golden Triangle of Kuala Lumpur, Menara Hap Seng is flanked by the majestic KLCC Twin Towers, the eminent KL Tower and the bustling presence of Bukit Bintang. This strategically located building (formerly known as MUI Plaza) was acquired in 2004 and is currently the Hap Seng Group’s corporate headquarters. The building, which is on Jalan P. Ramlee, is a known landmark in the past and remains iconic till today. Having undergone a major facelift, Menara Hap Seng’s stunning facade and modern interior houses 21 levels of corporate suites. In addition, there is also The Podium, which has a forecourt with water features, beautiful landscaping and three levels of alfresco dining, restaurants, retail outlets, banks and much more. The building also boasts a seminar hall, meeting rooms and an auditorium. The Auditorium and Convention Centre in Menara Hap Seng is an addition to the Podium at Menara Hap Seng and seeks to provide a cost effective and flexible alternative to managing seminars and functions. There are two seminar rooms and one auditorium. The Auditorium has a capacity of 350 people while the seminar rooms have flexible arrangements of up to a maximum of 110 and 60 pax respectively. 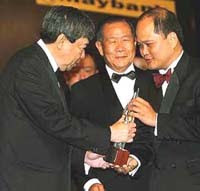 This year Menara Hap Seng has been awarded the Malaysia Property Award 2009 in the “Office Development Category”. Hap Seng Land chief executive (property division) Datuk Paul Ng Kee Seng. “We are really happy and delighted with the win this year. This building has remained an icon on Jalan P. Ramlee and it will always be remembered fondly by the people in the Klang Valley and beyond,” said Hap Seng Land Sdn Bhd’s Chief Executive (Property Division) Datuk Paul Ng Kee Seng. Looking at Menara Hap Seng one would recognise the open and bright atmosphere of the building. Surrounded by various shops and dining outlets, its’ simplicity is distinctly unique. In the past few years, the environment has been given much attention, including property development. Menara Hap Seng echoes the green theme by using nature as part of its design in making the office space a better environment to work in. The building has a skylight, which delivers large amounts of sunlight into the Podium. In the morning, the place is lit up with natural sunlight, which effectively saves electricity. The paint used is also environmental friendly. Menara Hap Seng has a wonderful concept of having the Podium with all the surrounding outlets in it. It was this concept that was one of the reasons for giving Menara Hap Seng a facelift. When envisioning the office space, the beauty and practicality was also the main theme in making it unique. “We want to have beauty in simplicity!” said Ng. Many people who come into our building are not our tenants but those in search of food, entertainment, banking or even some retail therapy. The energy and ‘chi’ this building brings is absolutely amazing,” said Ng. Menara Hap Seng is a unique building with its own characteristics. The simple and beautiful make of this office space makes the building a benchmark among other office spaces around KL. An iconic building contributing to the energy in KL, only more can be expected from this dynamic building and its’ plentiful offerings. In line with its “Live, Work, Play” theme of the Kuala Lumpur (KL) Sentral masterplan, Malaysian Resources Corp Bhd (MRCB) built its Sooka Sentral lifestyle centre with the sole intention of enhancing the lifestyle of the populace that work and live within the KL Sentral area. The concept for Sooka Sentral was crystallised to fulfill the need to provide a one-stop lifestyle hub to cater to the 130,000 daily visitors and travellers and over 25,000 professionals working within the vicinity. The winner of the International Real Estate Federation (FIABCI) Malaysia Property Award (MPA) 2009 under the “Purpose-Built Project” category, is strategically located next to Malaysia’s largest transit hub, Stesen Sentral. It offers discerning urbanites a unique health, beauty and dining experience within the exclusive urban centre. 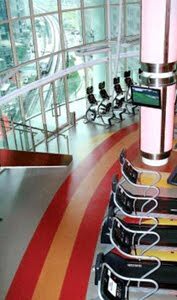 An indoor gym at Malaysian Resources Corp Bhd’s multi-level Sooka Sentral Lifestyle Centre at KL Sentral. “Sooka Sentral is very contemporary and iconic in its structure and represents urban lifestyle preferences. It is the only one-stop centre in the vicinity conceptualised to fulfill specific needs of its stakeholders - be it local, regional and international,” says MRCB chief operating officer Mohamed Razeek Hussain (pic). The external facade of the lifestyle centre is definitely something to marvel at. Unlike most buildings that are square or rectangular in shape, Sooka Sentral is dynamically shaped like an oval bubble – evoking a catchy avant-garde feel. Fusion of movement and nature is part of the concept, which is far from the conventional, formal homogeneity. Special care was taken to ensure that the overall space complements aesthetics, allowing natural light and fresh air to flow generously, adding to the overall ambiance. Comprising seven floors, the interior was designed keeping in mind the interests and profile of the visitors. Restaurants and dining outlets are reserved for ground, first and second floors to allow for greater public interaction and to cater for the higher foot traffic on the lower levels. Similarly, the slimming, beauty and spa salons are on the higher (third and fourth) floors while a 25,000 sq ft gymnasium occupies the upper levels – for more customer privacy. With a gross development value of RM80mil, Sooka Sentral has gross floor area of 180,000 sq ft and net lettable area of 100,000 sq ft. Mohamed Razeek says this is deliberately done. “An average office building efficiency would be in the region of 75% to 80%. With Sooka Sentral, it’s just below 60% because we wanted to give people ample moving space. It also adds to the vibrancy and the attractiveness of the experience. “We wanted to give people ample moving space. It’s toward a holistic existence. Because you spend the better part of your day at work, we want to make the experience (of Sooka) as pleasant as possible,” he says. There are currently 32 tenants within Sooka Sentral – representing a take-up of over 80%. It aims to achieve 100% tenancy rate with the opening of several food & beverage (F&B) outlets in the next few months. Half of the Sooka Sentral tenants comprise F&B outlets serving a variety of international cuisines and beverage options catering to all income groups. Other tenants include spas, beauty salons and a convenience store. Mohamed Razeek says MRCB is ‘very selective’ of its tenants. “We let out and maintain all of the outlets. Because it’s a lifestyle centre, we are selective of our tenants and don’t sell. When you sell, you lose control,” he says. The current average rental per sq ft is RM6, which translates to a 6% yield per annum. Sooka Sentral has been in operation since early 2008. While construction is 100% complete, MRCB is still looking to add upgrades to the lifestyle centre to maximise the experience of its patrons. “We try not to stay idle and always look at ways to improve. We are always open to feedback and try to make continuous improvements,” says Mohamed Razeek. Interestingly, the name ‘Sooka’ was derived from the Malay word ‘Suka,’ which means ‘to like.’ It was to be a reflection of how MRCB wanted its customers to feel about the lifestyle centre. “We wanted people to enjoy their experience there and ‘suka’ Sooka,” Mohamed Razeek says. Mohamed Razeek says winning an accolade such as FIABCI is proof that the developer is on the right path. “It gives us confidence that we are on the right track, and a bonus as Sooka Sentral introduces a totally different concept compared to other commercial developments in the country. “Sooka Sentral winning the award is an affirmation that the concept has served its target market well, befitting the ‘Purpose-built’ concept. The award will serve as a reminder of the benchmarks we have set and we will continue to meet those standards,” he says. KUALA LUMPUR: GLOMAC BHD is disposing of a 25-storey office block at Glomac Damannsara to Lembaga Tabung Haji for RM170.73 million. Glomac said on Tuesday, Nov 17 it had signed a sale and purchase agreement with the pilgrims fund to dispose of the building, known as Tower D with 444 car park bays. It said the property is to be developed over part of a freehold land measuring about 2.762 hectares. The development order was obtained on Sept 24, 2009. Glomac said the Property would be completed and handed over to Lembaga Tabung Haji within 36 months from the date of the building plan approval. "The en-bloc sale to financially-strong institutions such as Lembaga Tabung Haji is part of Glomac’s strategy to reduce sales risk for new projects as well as to further enhance the overall marketability of Glomac Damansara," it said.